Design: Torsion-style design to reduce premature wear, extra-hard, ideal for less demanding screwdriving jobs e.g. in wood. Tough-absorbing bits for hard materials e.g. sheet steel or metal. In this case the screw initially turns smoothly inside the defined thread. As soon as the head of the screw touches the material surface, high torque peaks are generated that have an affect on the screw and tool. This can mean that the bit breaks if it is too hard. Tough-absorbing Wera bits prevent any premature breakage of the drive tip. Wera Pozidriv bits offer dependable work and a long product service life because of their high precision profile design and outstanding concentricity features. 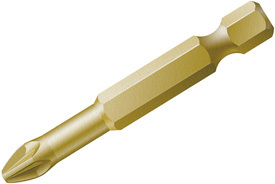 Wera Pozidriv bits have been designed for demanding applications in trade and industry. Recognisable in the catalogue through the article letters TZ. The 05060065001 Wera 855/4 TH 1/4'' Pozidriv Power Drive Bit is one of thousands of quality tooling products available from MRO Tools. Please browse Wera 1/4'' Pozidriv Power Drive Bits for tools similar to the 05060065001 Wera 855/4 TH 1/4'' Pozidriv Power Drive Bit. 05060065001 Wera 855/4 TH 1/4'' Pozidriv Power Drive Bit description summary: Wera 855/4 TH 1/4'' Power Drive Bit. Point Size: PZ 3 Overall Length: 50mm / 2'' Quantity discounts may be available for the 05060065001 Wera 855/4 TH 1/4'' Pozidriv Power Drive Bit. Please contact MRO Tools for details.